Hemianthus callitrichoides was discovered by Holger Windelov (founder of Tropica company) during the dry season in the river with a rock wash not far from Las Pozas, 90 km to the East from Havana (island of Cuba). The plant grew surrounded with large stones at water level about 50 cm high. Hemianthus Callitrichoides Cuba forms thick green small glades which resist to rather strong water flow, especially during rain seasons, when the plat gets submerged up to 1 m deep. According to the latest data Hemianthus callitrichoides grows only in Cuba, however Hemianthus micranthemoides was also found in North America. In aquarium hobby it has been used only since 2003, but since then it has become the most popular plant among the professional aquarists creating natural like aquascapes. Appearance of the plant is a miniature copy of that of Hemianthus micranthemoides. Hemianthus callitrichoides forms short small glades about 3-6 cm high and differs from Hemianthus micranthemoides in smaller leaves and shorter stem. The plant is a challenging one to keep, therefore it’s not recommended for beginner aquarists to keep. It has high demands in terms of mineral substances composition. It requires small grained substrate, high level of lighting and artificial CO2 supply. It is recommended to plant Hemianthus callitrichoides «Cuba» plants several centimeters far from each other. Essential condition of successful cultivation of the plant is strong illumination, CO2 supply and fertilization. Fast-growing plants neighboring with Dwarf baby tears plant may shad it in time and gradually push it out. To avoid such a situation, you should regularly thin out and trim the them. The plant is tolerant to lack of light and can develop successfully at such conditions, but in this case it grows elongated. However, if the light is very weak the plant stops growing at all. The stronger the lighting is, the thicker carpet it forms and at that its stems tightly bear to each other. This plant is rather demanding in terms of fertilization, especially to ferrum content in water. In case of lack of the latter its leaves become pale and small. That’s why it is a must to use iron-containing liquid fertilizers in a precise dosage. After adding them into the tank water, the plant leaves quickly restore their initial color. So, this extraordinary plant can be also used as an indicator of iron content in the tank. Provided with optimal conditions it turns out to be a quite fast-growing plant, that already requires fertilization in 3-4 weeks after it was planted. Additional CO2 supply together with high level of illumination cause increase of the plant growth rate. That’s why it requires some trimming from time to time. If you create ideal growing conditions for the plant you can go without CO2 supply. However, adding CO2 speeds up the plant growth rate in several times. 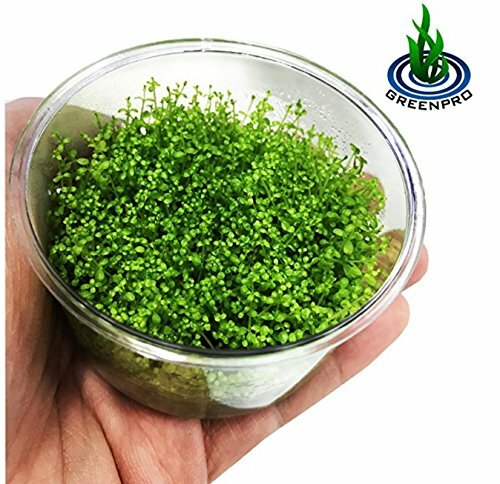 Optimal temperature for Dwarf baby tears plant is around 25°C, though it is quite ok with the temperature range from 20 to 28°C. Since root system of the plant is rather weak, it is not recommended to siphonage the substrate around it. You shouldn’t allow the carpet grow higher than 2 cm high, since this may cause its tearing off from the substrate. Therefore, periodical trimming of the carpet is necessary to reduce its volume. Optimal temperature for Hemianthus callitrichoides is 25 C, but it can grow at temperature range from 20 to 28 C.
The plant likes moderately strong water flow and filtration as well as regular water renew. If the water stagnates, the plant growing pace slows down. In case of insufficient filtration it gets covered with algae and loses its attractiveness. The most crucial and troublesome thing for an aquarist is the process of Hemianthus callitrichoides planting. As we’ve already mentioned above, to grow successfully the plant requires small grained substrate as well as absence of bottom digging fishes in a tank. The first one is when small bunches of the plant (not more than 1 cm in diameter) are put into cavities in the substrate and then they are buried so, that only several stems are left above the substrate. Some time later the plant appears on the surface of the substrate and starts to vegetate actively. The second way is based on planting separate branches (about 2-3 of them). This approach is used when you don’t have enough of planting material. To do this you’ll need long thin pincers. The plans are buried into the substrate completely and only their top is left on the surface. The lower part of the stem with leaves serves as an anchor holding the plant in the substrate until it forms its roots. To create a solid carpet the distance between separate plants shouldn’t exceed 1 cm.